The University of California, Berkeley (UC Berkeley) is a public research university located in Berkeley, California and it is the flagship school for the University of California system. 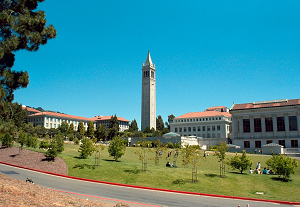 The university is situated on the eastern side of the San Francisco Bay, and, while Berkeley is not an Ivy League school, it is a very prestigious public university with an emphasis on research. UC Berkeley also has an intimate relationship with nuclear development and culture in the Southwest. J. Robert Oppenheimer, known as one of the "fathers of the atomic bomb," was a physics professor at Berkely before commencing work on the Manhattan Project at Los Alamos National Laboratory, which culminated in the testing of the first nuclear bomb at the Trinity Test site near White Sands, New Mexico. Currently, UC Berkeley administers Los Alamos Nationaol Laboratory in northern New Mexico, one of the premier nuclear research and development sites in the world. "The Berkeley campus" by Henri Sivonen is licensed under CC BY.